As it is today the work force is crowded, diverse, and unevenly talented. However, most importantly and most challenging, today’s work force is composed of five generations. Meeting this challenge and being successful at attracting and retaining needed talent is critical to an organization's current and future success. At Miles LeHane we believe that the essence of Employable Talent is twofold. First, entrepreneurs, talent managers, and HR managers must bring into the organization individuals who are aware of their own unique contributions as well as their blind spots. These individuals need to have the skills and awareness to succeed today and gain the trust and respect of others in tomorrow’s ever-changing environment. Second, as our nation is currently undergoing a redefinition of the World of Work and what the new employment agreement looks like, it is vital to recognize that it is the company’s responsibility to help keep talent employable and not just simply employed. Gone are the days where an employer owes an employee a job in exchange for hard work and loyalty. No longer are employees entitled to jobs simply because they have not done anything to lose them. In order to navigate this new world of employability and maximize your work force a solid understanding of the Four Pillars of Employable Talent (Resilience, Balance, Strategic Career Planning, and Financial Planning) is vital. Finding the right balance of these Four Pillars within your organization, as well as within any potential candidate, is the key to recruiting, attracting, retaining, and keeping your talent employable. More people are chasing fewer jobs than ever before, including legions of downsized executives and newly college graduates. 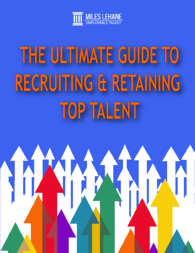 In this e-book, The Ultimate Guide to Recruiting & Retaining Top Talent, David C. Miles, Ed.D., SPHR, CMF, shares how organizations have changed their recruiting processes and what talent managers should be looking for in job candidates. Author David Miles argues that the new employment agreement between employer and employees has put a premium on what he calls "The Four Pillars of Employable Talent" - Resilience, Balance, Strategic Career Planning, and Active Financial Planning. - How to better able to identify, recruit and retain job candidates with unique sets of skills needed to support organizational objectives. - Learn what constitutes “Employable Talent”. - Further be able to develop your own leadership skills and advance your career. - How to help talent recognize their own genius and the specific contributions they can offer your organization.